It’s not every day you meet an extraordinary Common Sense Consultant hailing from Southern California! Expert Author Nancy O’Neill provides effective measures to help her readers become more confident in their own abilities, as well as become more self-reliant. For over 20 years, Nancy has shared her ideas, knowledge, and experience through short stories, poetry, and articles. 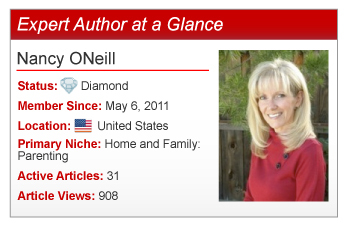 In January 2011, Nancy established her first blog and it wasn’t long before she joined the EzineArticles Expert Author community. 1. Write so it makes sense. I rarely submit an article or story to any publication without having someone else read it. It’s easy for a writer to think everything makes sense because it’s their words and thoughts. Having someone give it an once-over seems logical. Oftentimes my husband is my sanity check with my writing. I grew up in the Midwest [U.S.] where people tend to make long stories longer. So I often edit an article at least 5-6 times and sometimes more just to make it as concise as possible without losing the meaning and feel of the story. Marketing is probably the hardest thing for most people. When I first started writing, I wrote for myself. Once I decided to go public, I used various forms of social media to get more exposure and EzineArticles has been a great source of marketing. Most of my inspiration comes from everyday life relating to family, parenting, education, entrepreneurialism, publishing, changes in society… I find that I’m more inspired to write when the weather is warm. I often head outside and love to write with a good old-fashioned pen and paper while soaking up the southern California sun. 5. Ward off writer’s block. It’s hard for me to force my writing, but if I have to get a story or article done on a deadline and can’t think, I’ll do something completely the opposite of being creative like cleaning the house or grocery shopping. What also works sometimes is to just sit and let my mind wander. Try Nancy’s common sense article writing and marketing tips for your next set of quality, original articles and unlock the key to your extraordinary success! Do you have a question or comment for Nancy? Feel free to leave it in the comments section below. Great insight Nancy! Yes! People tend to make article writing too technical, which often deters readers instead of “wowing” them. I like an article which gets the point across simply and quickly! Thanks Nancy! Well, like I said, I have to be inspired to write pretty much anything. When it becomes technical or forced, the fun is gone for me and I end up writing very bad fluff, if you know what I mean. Sometimes I wonder if I am too blunt with what I say but I guess I’d rather be upfront and direct than tap dance around a subject. I am impress with your Common Sense Writing Tips. I thank your husband also who stand by you to help you achieve your dreams of passing ideas and knowledge to the world. My wife is sound and I would have love to be giving her my write-up for editing but the nature of my profession has always put us apart, and in most cases my laptop become my friend and companion, and I don’t have any body I know that I can give my work to. In such a case what is your suggestion? I do consider myself very fortunate to that my husband is willing to be my sounding board a lot for my writing. I understand how difficult it might be for you not to have anyone that you can give your work to for editing or feedback. You asked if I had any suggestions? If you don’t have a friend, co-worker, or family to proof your writing, you might think about joining an online writer’s critique group. Depending on what you write about, I’m sure you could find a group that would be a good fit. One thing for sure: just continue to write. Good luck. EzineArticles Feature is a great way to be seen and read. I was featured too…and also am in SoCal! Thanks for the comments and a congrats to you also. I never expected to be featured for my writing so I’m really grateful to EzineArticles. I love living in SoCal. Couldn’t imagine anywhere else since, like my interview said, I am most inspired when I’m soaking up the sunshine. By the way, I read that you ran the LA Marathon. Amazing!! You made my day when you signed your comment, “Your fan.” I can honestly say that no one has ever said that to me before so thanks. About distractions. I think everyone has those at least once in awhile. I guess that’s why in movies they always have the famous writer retreat to a cabin in the woods or a beach house for seclusion in order to not be disturbed. Probably even the best writers can get distracted. For me, I don’t even try to sit down and write if I’m not in the right frame of mind or there is too much going on because I’d get distracted too. So I guess that would be my advice: Pick the right place to write with the least possible distractions. Then you won’t be tempted. All good points, but at 5-6 edits are you not in danger of over-editing? I guess it depends upon the work at hand – and every writer has their own process – but I know for myself that sometimes you tend to lose something after a few too many edits. I completely agree that marketing is fundamental to achieving success as any form of writer. Of course, there are just so many different ways of doing this that trial and error is a big part of the process. If I get to 5 or 6 edits, it’s almost always to make the writing tighter. I’m not really changing the meaning or direction so even with that many edits, the content pretty much stays the same. You’re right about different ways of marketing and what works for one may not be right for the next guy. I can’t stand it when someone wants to cookie-cutter everything. Life just isn’t that way. Sometimes half the fun is the trial and error part. I totally agree with you which is why I very rarely watch or read the news. It all tends to be the worst of life and people. Even though I often point out negative issues, especially on the topics of kids and/or education, which get me very passionate, I always try to offer a solution and end on a positive note. Great information and thanks so much for sharing. My goal is to become a obtain Diamond status and this was extremely helpful. I love that quote from Mark Twain. It totally something that someone from the midwest would say. I think I’ve probably heard my mom joke about that one too. Great inspiration for a newbie-thanks. Have a nice day on purpose! Glad you liked it. And hey, we’re all newbies at some point. And after reading these comments, I did have a nice day “on purpose” as you suggested so thanks. My favorite of your tips is to be concise. I get frustrated when I read something that goes on and on, is too repetitive and does not precisely clarify it’s main points. Good writing can be simple yet profound. I grew up in the south and understand how you can turn a story into a long drawn out narrative. The pace is slower than it is here in California. I am going to start having a business associate review my articles so I will get a second opinion before submitting. After seeing so many people post blogs that read like they went straight from their head to online, full of errors and some not making sense, I wrote a blog about proofreading. If he’s traveling and he can’t read the articles, I’ll give myself at least a few hours away from the topic. When I come back, I usually find the right tone for the article. Good luck with your writing and it might be fun for you to have that second opinion, at least some of the time. Although the short stories I’ve written are mostly just for my own enjoyment, I do have a friend who was an English teacher, read them for clarity, etc. And I hated writing my blog posts until I threw out all the “rules” of writing one and wrote the way I wanted to do it—so it truly sounds like “me” :-) Oddly enough, then I started to get more readers…hee hee! I’ve heard people say that to be good at any art form is to know the rules but understand when it’s okay to break or bend them. I think people can have their own voice while still following the rules of grammar, punctuation, etc. That’s great that you increased your readership. Congrats. Great tips Nancy. Glad to see a prolific writer like yourself getting recognition for your high quality content. Keep up the good work! Thanks for the compliments and encouragement. I was truly honored that EzineArticles gave me this recognition. I am not sure whether or not you are the one who wrote the wonderful story “A Grandma’s Love,” from the Adopted Soul book of the Chicken Soup for the Soul Series. The story, however, touched my heart and soothed my soul in a very positive way. You all made my day. All I can say is thank you. I really appreciate you reading my interview and hope you continue reading my articles. Read your entry with interest since I am just starting to get my feet wet on EzineArticles. I have been writing for myself, self reflecting and now is time for me to share the digested material of a life long journey of transformation with readers. English not being my mother tongue, I will diligently have someone else review my articles. Thanks for inspiring me to comment! I’m so glad you were inspired to comment because I love connecting with other writers. I, too, wrote just for myself for many years. It wasn’t until I helped my mom and my teenage son write and publish their first books that I really got into writing again for others. It’s been a great journey. Just keep writing. Good luck. Writing is the best way to promote businesses on net, like websites and blogs. Your above tips just make it more easier even to starters. These is the tips i use to market my online safari holiday website online, and it works. Good content.